Are you interested in starting your own art journal, improving your art journal techniques, looking for new ideas for backgrounds, pages etc.? This great blog provides ideas, tutorials and guidelines, check it out for some inspiration and education. This entry was posted in Videos, Pen & Ink, Tips and Hints, Ideas & Inspiration and tagged art journal, mixed media, tutorials on August 31, 2015 by Fiona Machugh. Whats so great about Gelly Roll Pens? Gelly Roll Pens are gel ink pens which come in a variety designed for writing and doodling with. They were the first pens that created the gel ink category within the writing instrument industry. These creamy pens are ideal for creating art, writing in scrapbooks & journals, signing documents, daydream & doodle. These pens are chemically stable, waterproof, fade resistant, no smearing, no feathering and the ink does not bleed through on most papers. These pens make writing and self expression effortless. You will find that there is an incredible array of colours to choose from providing favourite "flavours" for allowing your thoughts flow directly onto your chosen paper surface. What colours go Gelly Roll Come in? You can use the gelly roll pens for writing cheques also - making writing these out a lot more fun and prettier - but ideal colours for this is either black, blue, royal blue & burgandy due to the gel ink's resistance to fraudulent washings. Gelly roll pens come in a variety. You get them in ranges of Glaze, Metallic, Stardust, Moonlight, Classic, Gold & Silver Shadow. We sell the Glaze, Metallic and Stardust ranges in our shop which, you can also purchase online on our website. Look at just a few of the things you can do using these beautiful Gelly Roll pens. 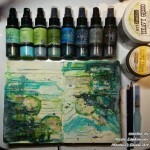 Watch the following video to see how you doodle with gelly roll pens using a variety of the pens. Watch the following video to see how you write with the gelly roll pens and see the effects they give on light & dark papers. This entry was posted in Pen & Ink and tagged art, artist quality, craft, craft materials, Sakura, Gelly Roll pens, crafts, writing, doodling on August 26, 2015 by Natalie Jane Wallace. We were lucky enough to be able to go and speak to one of WASP Dundee’s resident artists, Jonathan Hood for the second of our Dundee art profiles. Despite this Hood did go on to Art College and studied at Duncan of Jordanstone from 1976 to 1979. He then left his studies there to follow the route many of the worlds and history’s most famous artists have; to study in Paris. After this seminal experience in one of the world’s artistic capitals, Hood returned to Scotland. Whilst Hood attempted to establish himself, he was fortunate to be noticed by Christine Heinzel, an event which may have substantially altered his fortunes. It isn’t hard to see why Hood’s eye catching work has proved so popular over the course of his career. We wanted to know a little more about how he chooses his subject matter, materials and his method. Spontaneous inspiration is important to subject selection in Hood’s work also. We asked Hood about what he thinks prevents people from getting into or involved with art? We asked about what advise Hood would give to those about to embark on an artistic career, the response was practical but ominous. 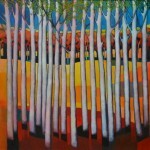 Jonathan Hood regularly exhibits work in various galleries including the Sun Gallery, Newburgh, Scotland, the Eduardo Allessandro Gallery, Broughty Ferry Scotland, Abiergo Casanova Gallery,Lucca Italy, Jeanne o Contemporain 2012 Orleans, France and the Laurel Gallery, Stockbridge, Edinburgh, Scotland. This entry was posted in Painting In Acrylic, Blog Home, Ideas & Inspiration, Profile on Artists and tagged Art Profiles, WASPS Dundee, Jonathan Hood, painting on August 13, 2015 by Fiona Machugh. A new trend for the hobby world? Adult Colouring books are the new trend sweeping the creative hobby world and tidying up in the top- sellers lists across the world. The Guardian has run a series of articles commenting on the phenomenon, some supportive, others scathing. Whether the assessment of the craze is positive or negative the fact that such a major newspaper has dedicated so many column inches to the subject is just one indication that this trend is attracting quite a bit of attention. The books are proving a publishing phenomenon. One Guardian article claimed that the books are now selling faster than cookery books in France, with last years total sales shifting a massive 3.5 m books. Another stated that last month five of Amazon’s top 10 were adult colouring books, as were six of the top 10 non- fiction books in Brazil. Scottish Illustrator Johanna Basford whose colouring book The Secret Garden was one of the chart toppers this April has sold over 1.4m copies to date. 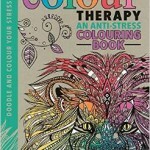 Colouring is still a form of creativity and we shouldn’t have to stop just because we pass a certain age. Most of us did it and many of us loved it growing up. But we get to an age, where like so many of these things we think, why am I actually doing this? What is the reason for it? Am I going to make money from it? So many people give up on creative projects when they “grow-up” because it isn’t seen as a valuable use of time. With this proliferation however of colouring books aimed at adults you can take up the activity again without any fear of social recrimination as not only is it acceptable, it is fashionable. You can colour everything from Benedict Cumberbatch to Tattoo Designs, fairies and animals to intricate doodles, henna designs, Japanese inspired and funky animals. However this new wave of books are not simply being marketed as a way to be creative and get in touch with your inner child. Many are specifically being marketed as a type of art therapy which is supposed to help people with everything from stress, to sleeplessness to mindfulness. Ana McLaughlin, head of publicity and marketing at Michael O’Mara (UK publisher which has sold over 340, 000 adult colouring books) attributes the genres success in main part to this remarketing strategy. Lucy Fyles has a blog, in which she reviews various examples from a mental health point of view. There are hundreds of testimonies all over the internet from individuals who claim that the activity has helped them deal with everything from the normal daily stresses of life to far more serious forms of mental distress. The basic principal works on the concept of involvement in an activity which is both simple and absorbing at the same time which quiets the mind and allows the practitioner to disconnect from the general world around them. The success of this kind of activity shouldn’t really be surprising, an activity with a very similar ethos behind it has also been causing a storm in the art world recently, namely Zentangle. Whether people are taking it up as a creative or a therapeutic activity (or a combination of both) there seems to be no doubt that many people are enjoying the activity and feeling the benefits one way or another. And after all why not? The books are really just an extension as well of the very popular free downloadable colouring templates which carders have been using for some time as templates. If you think about it carefully, there isn’t really so much difference between intricate colouring and say creating a cross stitch from a manufactured pattern or following a knitting pattern. They are all levels of a creative process. Anything which provides the release of creative energy and decreases stress is something we at iartsupplies can fully get behind. iartsupplies has several product ranges which are ideal for this activity if it is something you are thinking of taking it up. Although there is no set material which must be used in the activity here are the ones we stock and would recommend to get you started. Although feel free to check out full range of products, the only limits on your creativity should be the ones you set yourself. Our Koi Brush Watercolour Pens come in a vibrant range of colours and are very reasonably priced. The brush style tips and water based inks mean you can use them like felt tips or combine them with water to create a watercolour effect. Want a bolder graphic style? Why not give our Stylefile markers a shot? The ink can be blended with the colourless blender, but the real beauty of the Stylefile range is the opaque dense nature of the colour. Our pastel pencils are available individually and ranges of colouring, water-colour and pastel pencils are available as sets. Click here to see the ranges. So why not check out the ample range of colouring books on offer at Amazon, The Works or your local book seller, then drop into us for your materials. You'll never know until you try. This entry was posted in Blog Home, Pen & Ink, Ideas & Inspiration and tagged Adult Colouring Books, art therapy, hobbies, relax, creativity on August 13, 2015 by Fiona Machugh. 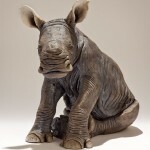 Nick Mackman produces some truly wonderful animal sculptures which we love to share on our Facebook page. Read about what influences and inspires her on her blog and you can also check out the website on her gallery while you are there. This entry was posted in Sculpture and tagged sculpture, Nick Mackman, animals, inspiration on August 5, 2015 by Fiona Machugh.